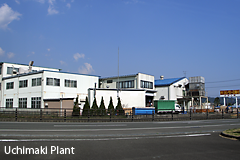 Uchimaki plant started business in October 1983 as dedicated Flexo printing plant. 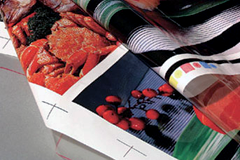 Since then, we have searched and developed all the possibilities of the Flexo printing. In the traditional Flexo printing system, printing on embossed nowoven textiles or elastic films or fabrics, which are very difficult by the gravure printing, are conducted as extension of special printing technology. However, thanks to practical use of water based ink and overwhelming improvement of printing quality, printing on those materials can be smoothly executed with consideration of environments. We added Abeguchi Flexo printing plant in 2001 in order to extend high quality Flexo printing production system. We have gone through so many trials and errors in terms of the Flexo printing of high frequency of dot using water-based ink only, aiming at considering further environmental problems. And now, we have established mass production system Flexo printing using water-based ink not only paper but onto film and nowoven materials. 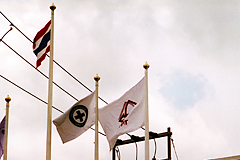 In May 2005, we opened Thailand plant as dedicated plant where Flexo printing using 100% water-based ink is conducted. Yoshimoto Printing CO.,LTD. have established cutting-edge technologies and experiences, and continued to provide world-leading technologies as pioneer of the Flexo printing system.